Barbara Price is a writer and editor living in Fresno, California. When she’s not writing, editing, hitchhiking, or having religious experiences via social media, she’s chasing her kids or driving them somewhere. Some of her poems have recently appeared in Slant, BorderSenses, and Redactions. Barbara loves to hear from other writers–look her up at www.editthis.biz. Elizabeth Vandermolen: Hi! This is Elizabeth and today I am interviewing Barbara Price. First off, thank you for taking the time for this interview. You had two poems in the last edition of the Silk Road Review and both featured an very narrative style. What attracts you to this form over, say, fiction? Barbara Price: Thank you, Elizabeth! Yes, some of my poems are very narrative, but of course they’re not tiny prose stories. When you’re writing — and when your goal perhaps is to pack as much meaning into as small a package as possible — poetry gives you more possibilities to make your meaning in a concise way, more ways to present your ideas from as many angles as possible. A poem, even a narrative poem, offers me more possibilities than a corresponding piece of fiction. For example, I love crafting the rhythm and flow of a piece from beginning to end. If it doesn’t sound right to me all the way through, if the right rhythm isn’t there, it’s not done yet. Certainly there is fiction with beautiful rhythm and flow, but it’s unsustainable — and I think sometimes it gets lost, too, in the bigger context of a prose piece. In Winter 1979, which appeared in the last edition of Silk Road Review, the somewhat choppy rhythm, along with the repetition, give readers an idea of the speaker’s uncertainty and hesitation, her ambivalence, the fear that seems to be lurking around the edges — maybe she protests too much that “it didn’t feel dangerous” or maybe the adult speaker knows something in hindsight that the hitchhiker doesn’t know. If I were to convey all that in a short-short piece of fiction — well, I don’t think I could. It would turn out overwrought and melodramatic. In a poem, the rhythm can do that work for you. EV: Who would you say are your poetic influences? BP: This is such a hard question — every poet I’ve ever encountered has been an influence. Every poet I’ve read, every poet in every workshop, every poet who’s asked for or given me feedback, has been an influence. That’s true of everyone, right? And if you ask me to pick certain names, I feel that little twinge of panic that an Oscar-winner must feel, with too many people to thank, not enough time, and the certainty that she’s going to leave out someone absolutely essential. How can you even try to name names? Even if someone else’s work is not directly visible in your poems, if you’ve read their work, you’ve absorbed it, and you’re influenced in some way. No one would likely recognize the influence of Lucille Clifton in my poems — as much as I might wish it were so — and yet, the way she could pack so much beauty, pain, and power into such short poems has had a huge influence on me. These are qualities I study in her work, qualities I aspire to. Even if you can’t see her, Lucille Clifton is there. I also admire and study poets who use humor not just to be entertaining but in service to another purpose. I resist the idea that anything funny and easily understood should be thrown into the dreaded category of “light verse” or lumped in with “There once was a girl from Nantucket.” Sometimes, if you make readers laugh, they don’t look beyond that — they figure your poem is a throwaway — and you need to work a little harder to show them, “No, I also have something to say here.” So I spend a lot of time reading poets who do the things I hope to do, like Bob Hicok, Aimee Nezhukumatathil, Tony Hoagland, Thomas Lux, David Kirby, Margaret Atwood — and of course I couldn’t help but notice Billy Collins’ influence on I Find God on Facebook. My poems tend to fall into two categories — funny or dark — and I’m always working hard to bring the two closer together, to synthesize these two halves of my poetic personality. So, certain poets, I revisit them again and again, studying them, asking myself, “How does this poet do what I want to do?” I keep going back to Kim Addonizio’s “The First Line Is the Deepest” again and again, for this reason — it’s so funny and so sad. EV: I really enjoyed your poem I Find God on Facebook. In particular, it discusses issues of faith through the humorous metaphor of social media. What inspired this idea? BP: Thank you! Before I wrote this poem, a lot of thoughts had been running through my head. As anyone who writes poetry knows, you’re not necessarily thinking, “Let’s write a poem about these things!” — they’re just things you think about day to day, things you keep coming back to, and eventually they’ll find their way into your work if you let them. Social media has become a bigger presence in our daily lives — even when you meet people face-to-face, the conversation seems to work its way around to someone’s posts or pictures or news. It’s like we’re all living in the same small town now — and for better or worse, you know people’s business, even people you haven’t seen in years. Also, Facebook has become something like the “permanent record” that every vice principal warned us about: “This will go down on your permanent record!” There are stories — whether true or apocryphal — of people losing jobs, failing to get jobs, destroying friendships, undermining a romantic relationship, all because of their Facebook activity. And so in recent years, people have put more thought into what they put out there — they work toward sanitizing their image, making it safer: safer for work, for their bosses, for their kids or elderly relatives — because in some sense we all fear judgment. On the other hand, you can’t please everyone, so this is an impossible task, right? 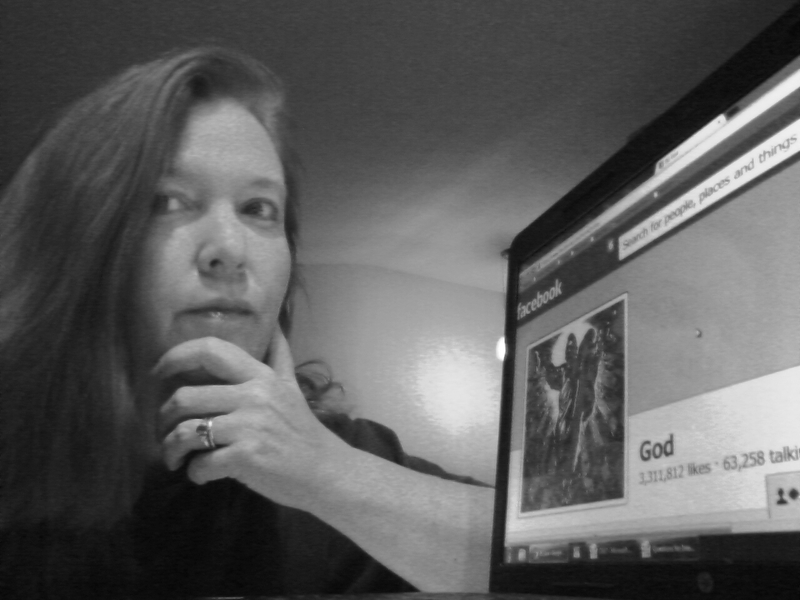 Meanwhile, God or religion crops up fairly regularly in my work, too — it’s another ongoing obsession — so one day when I was thinking all these thoughts about social media, this just popped into my head: “What if God were your Facebook friend?” The idea made me laugh — but it also spoke to these other thoughts and concerns. If God were your Facebook friend, you might have all these concerns about your online presence — but even more so. And so…I went with that, and discovered that my speaker was not only afraid of judgment; she also judged. It turns out that God and his buddies were annoying Facebook friends. EV: In your poem, I Find God on Facebook, you state “The Internet is forever. Yes,/ the Mardi Gras photo of me/ flashing that redneck in Biloxi/ named BillySam or SammyBill/ will live somewhere for all eternity.” Would you say that burgeoning writers should be careful of what they post? Especially given the importance of social media in today’s publishing world? BP: In some sense, no, I would say just the opposite. If you have a Facebook account, say, and you avoid posting anything that might be controversial, anything that might make someone squirm or judge you — and these days, some people try to do just that — you’ve got to ask yourself: What’s left? You’re not portraying a real person anymore — you’re portraying some sort of bland dilution of yourself. You’re like a homeopathic remedy: nothing’s left of the original substance. You’ve taken out everything that made you real. You might be safe, but who are you? So my advice would be the opposite — be exactly who you are, without apology. If you’re the person who flashed that guy in Biloxi, be that person. If you like watching and discussing reality TV, be that person. If you love to post pictures of your twenty-six cats in vintage designer shoes, be that person. Don’t worry so much about your image. Don’t worry about seeming cool enough, or smart enough, or wholesome enough, or whatever it is you’re worried about. For a while, I struggled with this, with the “image” I was putting out there. I like to post photos of my kids, and very few women artists — take a poll! I’m sure this is true — want to project an image of being “a mom who is crazy about her kids.” We’re afraid it makes us sound dull, or the opposite of glamorous or artistic or intellectual or deep. Fill in the blank. Especially if you’re a woman, there’s a sense that you’re not serious enough about your work — or you’re not interesting enough — if being a parent is also very important to you. Well, screw that. That’s who I am. Or, take political posts — especially right now before an election, everyone complains about people who bombard their Facebook friends with political posts — and hey, I hate that too — and yet sometimes I feel strongly about an issue and will make a strongly worded, strongly felt political post. So hate me. At first I was worried about what people would think — about my kids’ pictures, about my political posts, about my swear words or lack of tact, about my silliness or my strong opinions — but if I censored those things out, there wouldn’t be anything left but a safe persona, interchangeable with any other. Anyone who won’t give me a job because of my online image, or anyone who thinks I’m too boring, not serious enough, too political, too tactless, too impulsive, too maternal, whatever — well, I’ve made my peace with that. I don’t need to impress those people. As artists, that’s all we have — that’s all we can bring: who we really are. EV: Your second poem, Winter 1979, focuses on a young woman hitchhiking during the last winter Ted Bundy was at large. How often are you inspired by recent historical events such as this? BP: Fairly often — a sense of time can be as effective as a sense of place. Not every kid was hitchhiking in the slush in New Hampshire in 1979, but every woman of a certain age remembers Ted Bundy, remembers the news coverage, remembers how it made her feel or how it affected her view of the world. I tend not to write about the “biggest” events — I haven’t written a 9/11 poem, for example. It’s hard for me to stake my claim there — so many other writers have already covered it so thoroughly and so well. But I’ve written about the era that followed 9/11 — about a wedding in Afghanistan that was bombed, or about a soldier with a head injury, or about Jenna Bush’s wedding. So…I don’t necessarily choose the biggest headlines, but I choose events that might speak to a reader and invite her own thoughts or reactions, or invite her in to a conversation. EV: All right, last questions. What are you currently reading? Or name one book you insist goes on our readers’ bucket lists. BP: Right now I’m re-reading everything by Robert Frost and Louise Bogan. Their work changed and evolved so much — it fascinates me to look at how much, and in what ways, their work changed. And for the bucket list: One book I find myself zealously pushing on every poet I meet is “The Door” by Margaret Atwood. It’s one of those books that shifted the way I look at poetry. She blends the serious and the funny in such a genuine, graceful, powerful way. She’s so highly regarded as a fiction writer that her poems don’t always get the love and attention they deserve.